You wouldn’t market to the CEO of a Fortune 100 company in the same way you’d market to a SMB marketing director. Why market to your customer and prospect audiences in the same way? When you prioritize segmentation, you enable your company to target the right audience with the right message at the right time, while delivering a superior experience. 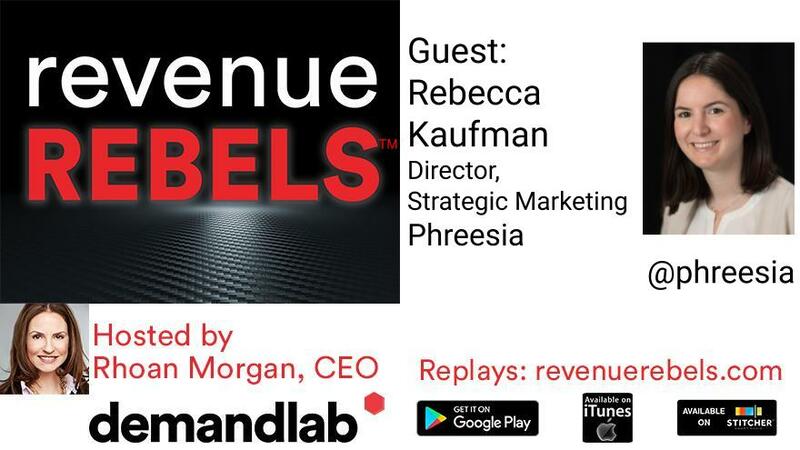 This month on Revenue Rebels, Rhoan Morgan sits down with Rebecca Kaufman, Director, Strategic Marketing at Phreesia to discuss the importance of segmentation in marketing. Revenue Rebels is hosted by Rhoan Morgan, CEO of DemandLab the host sponsor. Hear the best of Rhoan Morgan here.